What is an Environmental Impact Statement? The U.S. Army Corps of Engineers (the Corps) has determined that an Environmental Impact Statement (EIS) is needed to properly evaluate the Applicant’s proposal. 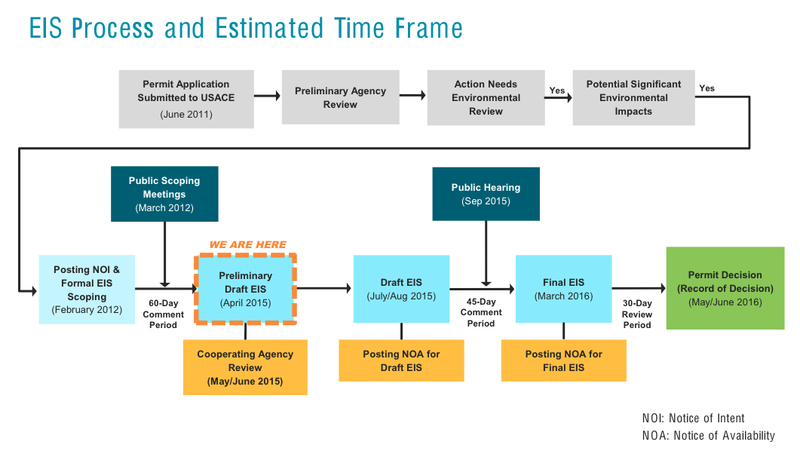 An EIS is a document required by the National Environmental Policy Act (NEPA) for major federal actions that could “significantly affect the quality of the human environment.” A Corps permit decision is the specific major federal action that triggers the need to comply with NEPA. The EIS process addresses the direct, indirect, and cumulative impacts of the proposed project and a reasonable range of alternatives. The EIS scoping process solicits feedback from the public, governmental agencies, organizations that may have an interest in the project, Indian tribes, and property owners adjacent to the proposed project. The EIS will assess the potential social, economic, and environmental impacts of the construction and operation of the reservoir, raw water conveyances, and associated facilities. NEPA is a federal law that requires the identification and analysis of potential environmental effects of major proposed federal actions and alternatives before those actions take place. NEPA assures that environmental factors are considered equally with the technical and engineering components of a decision. NEPA requires federal agencies to identify all potential environmental effects and any adverse effects that cannot be avoided, and to evaluate alternatives to the proposed action. A Draft EIS, which will present an evaluation and analysis of significant environmental and socioeconomic impacts of alternative actions and will be distributed for public comment. It will include analyses of effects on natural resources (water, plants, and animals), cultural resources, land use, recreation, aesthetics, and the socioeconomic environment. The Draft EIS will include a description of the baseline environmental and socioeconomic conditions against which effects of the proposed action will be evaluated. It will also include an analysis of potential consequences and appropriate mitigation measures (actions to lessen adverse impacts). A Final EIS, which will address public comments regarding the Draft EIS. A Record of Decision (ROD), which will document the final decision on the proposed action and will specify the needed mitigation measures and monitoring programs based on the information presented in the EIS.